Me and my Little Angels love to eat fried chicken. So, when there is an invite to taste the Korean Fried Chicken, we accept the challenge to taste something different. Established in 1982, Pelicana Chicken is the longest standing and the largest stand alone Korean styled fried chicken franchise. World famous in Korea for its fried chicken and sumptuous sauces. Their mission is "Good Food, Great Place, Truly Korean". So, it you want to find the real Korean Gourmet Chicken - Pelicana Premium Chicken was your choice as it is Fresh & Delicious. Tommy, my blogger friend was there to serve us and introduce different variant of the fried chicken that Pelicana Chicken had. Me and my Little Angels able to taste all the variants. Now, let me introduce to you one by one to see what type of Pelicana fried chicken that suitable for your taste. Original Peli Yang Nyeon Chicken Spring Onion. Not spicy and taste good with their rice. All these 3 types of Peli Yang Nyeon Chicken were priced at RM32.90 for 14 pieces and best mixed with rice. Their Korean Fragrant Rice was mixed with black sesame and seaweed to get the best combination of the taste. Instead of usual chilies and tomato sauce, Pelicana had a special sauce to dip with the chicken i.e. 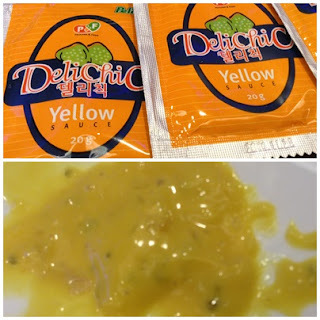 DeliChic Yellow sauce. Its like mayonese with a bit of wasabi taste. Something different to try on. For drinks, do try out their Mocktail Series which consists of Maracuja Pineapple Passion Fruit with slices of pineapples, Peach Forest Maracuja Apple and Maracuja Apple Rose with a plum for a refreshing taste which price at RM8.50 each. For smoothies lovers, lets try their Forest Fruit Yogurt Pineapple Maracuja and Yogurt Caramelised Apple Peach Yogurt Pina Colado (Pineapple coconut) which price at RM10.90 each. For burger lovers, check out for their Burger Peli Jumbo Fillet Burger with chrunchy chicken breast as the meat which price at RM15.50 and Peli Spicy D' Fish Burger at RM13.90. Both come with fries. Life will not complete without the dessert. Introducing their must to try dessert, Affogato Solo. Coffee add with vanilla ice-cream. Sweet and creamy to complete your meal. 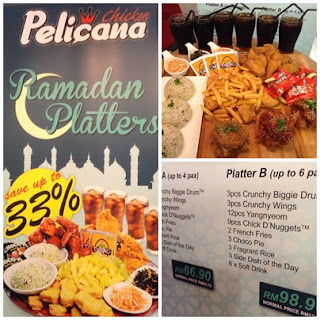 Good news to all as Pelicana Chicken is having a Ramadhan Platters Special where you can save up to 33% to dine in with your family and friends especially during this Ramadhan period. Check this out. Please be informed that all these great meals only available at e-Curve (Next to Ikea), Level 1, Lot 1-43, Mutiara Damansara, Petaling Jaya. Contact : 03-77320087. For more information and updates, do check out their FACEBOOK and Twitter/IG : @pelicanamy. Thanks to Pelicana Chicken for the great taste of the fried chicken. Me and my Little Angels love the taste of it as it is something different that we used to have. Chrunchy and fresh and do doubt, it is the best Korean fried chicken. So, if you want to try something different with great taste, lets hop-on to Pelicana Chicken at e-Curve to taste it yourself together with your family and friends. hahaha in short, PKFC! haha but not cheap too ya comparing to KFC! Do You Need A Finance Doctor? Jane, ayoyo sedapnyaaa. Ramadhan Platters tu banyak jimat compare beli ala carte! Must try kan! will going back for sure! I love the Peli Crunchy, my favorite!! My friends and I love Pelicana fried chicken so it better than KFC fried chicken! Hi Jane! Looking at your blog makes me hungry again! Memang yummy!~ Let's go eat again.. hehe! It's great meeting you that night Jane :) Reading your blog at this time makes me crave for it again!!! Definitely be back for more!